Here you will find information about website development, hosting and support for Newsagents Wordpress wesbites. For more information about the Newsagents Wordpress Websites or to discuss your website needs call us on free call 1800 902 900 or click here to contact us. To see how your Wordpress website can work for your business, take a look at the examples below. Use the links below to preview or visit the websites. To view the mobile version of a website simply visit the site using a mobile phone or tablet and the mobile version will be displayed. 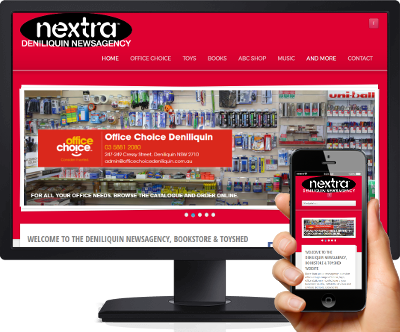 Website development and updates are designed to promote the complete range of products and services your newsagency offers. The website content is developed for you following your response to a simple checklist about the products and services you offer. To ensure your website is always kept up to date a regular website updates and support service is provided. upon completion your website hosting and support package will ensure your website always looks current and is kept up to date. quality website hosting in an Australian based data centre to ensure maximum download rates and uptime. Your hosting and support package ensures your website always looks up to date. The website development will commence upon receipt of both your development checklist and your initial payment. The website will be developed over the following four weeks. Your Newsagents Hosting and Support package will commence approximately four weeks from the commencement of the website development. An optional add on to your Wordpress website is a WooCommerce Shopping Cart to enable online sales directly from your website. Installation on your website with the standard WooCommerce set-up & features plus adding up to 25 products** can be completed for $880 (payable in two instalments: 1st $440 to commence the add on development and 2nd $440 upon completion of the development). Ongoing hosting and support will be provided at $19 per month in addition to your standard website hosting and support package. * The services provided are limited to those possible within the content management system of your Wordpress website. Services are provided on the basis of sharing the available resources across the subscription membership. Where requests for services are considered to be above what is �fair� we will discuss this with you along with options for alternative arrangements to meet your needs. ** Assistance will be provided to allow you to directly add and manage additional products on your Woocommerce shopping cart site, alternately an additional ongoing management arrangement can be made for New-Web to manage this for you. For more information about the Newsagents Wordpress Website and Hosting & Support package or to discuss your website needs call us on free call 1800 902 900 or click here to contact us.